Hi everyone! This is GiGi from The Cricut Bug and I am sharing these fun pencil Valentines I made. These would be super fun to make with your kids instead of buying store bought Valentines. I started these with the Scallop Slider and Topper Die and cut them out adding the pencil holder slots to the sides. I paper pieced the monkey from the Monkey See Monkey Do stamp set and cut them out by hand. 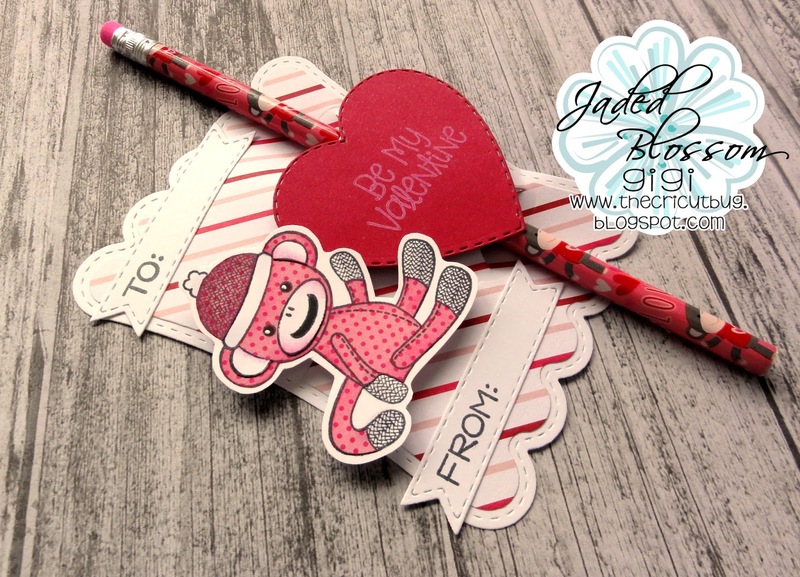 I added a heart cut with the Heart Dies 1 and stamped the sentiment from the Valentine Signs stamp set. I cut the sentiment banners using the Mini Tag Dies 2 and stamped the "To" and "From" from the Fun Money stamp set. To finish, I added the pencil and pop dotted the heart and monkey to the front. These are adorable-- your paper piecing is perfect! I just think these are so stinkin cute!! !